It happens every time I’m preparing to go on a family vacation. I tell myself, my wife, and my children that I’m really going to disconnect from work this time. I won’t be checking email on my phone, answering questions that could wait until my return. I’m going to fully embrace time with my family, be present in the moment and unplug on vacation. That usually lasts for the first few hours of the vacation, or maybe the first day. Then I see that little red circle on my phone, telling me I have 57 unread emails, and I decide I’ll sneak a quick peek to make sure there’s nothing urgent that needs my attention. From that point on, I usually decide I’m willing to sacrifice 20-30 minutes of vacation time every day in order to stay up to date and avoid hours upon hours of wading through email when I return to the office. It’s a sickness, this inability to unplug on vacation. And while I wish I didn’t suffer from it, at least I can take comfort in the knowledge that I’m not alone. A recent survey from staffing firm Accountemps shows that only 44% of workers say they don’t check in with the office at all while on vacation, down from 47% in 2017 and 59% in 2016. The survey was developed by Accountemps, which is a Robert Half company, and conducted by an independent research firm. It includes responses from more than 2,800 workers in 28 different U.S. markets. In addition to showing the growing trend toward staying in touch with work while on vacation, the survey also identified some interesting facts related to age, gender, and geography. For example, 70% of respondents ages 18 to 34 said they would maintain some contact with work while on vacation, compared to only 39% of those ages 55 and older. And while 52% of women surveyed said they would not check in with the office at all while on holiday, only 34% of men said the same. Of the 28 cities included in the poll, Nashville, Dallas, and Los Angeles had the most workers who did not plan to take any summer vacation. Employees in New York, Charlotte, Los Angeles, Miami, and Seattle were most likely to stay in touch with the office, at least several times a week. Those in Cleveland, Minneapolis, Denver, Philadelphia, and Salt Lake City were most likely to disconnect from work while on vacation. As a resident of the Salt Lake area, I guess I’m an outlier in that I’m likely to stay at least somewhat connected when I go on my summer trip. Maybe my neighbors and colleagues can give me some tips on how to really get away. It’s important to do so, according to Michael Steinitz, executive director for Accountemps. “Employees need time away from work to rest, relax, and recharge,” Steinitz said in a press release about the survey. “Yet for an increasing number of people, totally disconnecting from the office can have the reverse effect and add stress. As a natural worrier, I place myself firmly in that category. But that doesn’t mean I can excuse my vacation phone-checking. Since I’m a manager, I need to remember that the example I set may also have an impact on my employees. If I encourage them to completely disconnect while they’re away, but I don’t do so, will they feel nervous if they don’t check in, too? 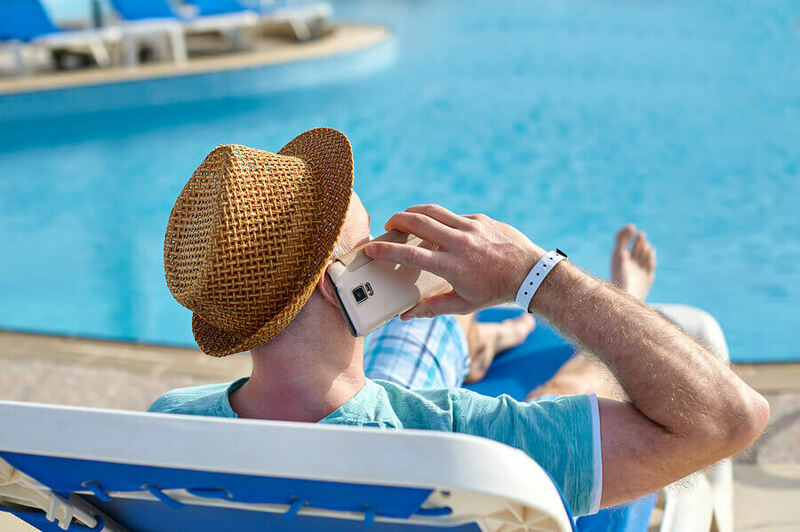 It’s possible to truly disconnect, and that’s why some companies are taking the step of temporarily suspending employees’ email accounts while they are on vacation, in the hopes that the forced disconnection will allow people to truly relax and rejuvenate. My employer is unlikely to take that step, but it’s worth remembering that true vacation time, free of email checks, helps reduce employees’ fatigue and burnout. I guess what I—and many other people—need to remember is that it’s OK to set boundaries between work and personal life. In fact, doing so is quite healthy, as a rested worker is more likely to be energized and motivated when they return from time away. I’ll try to keep that in mind this summer when I feel the urge to steal a glance at my email while on vacation. Maybe I’ll finally find my personal cure to this particular ailment, allowing me to more fully enjoy time with my family and to be a happier, more productive worker when I return.